Something that has been making me happy lately is the surge of bright clothing into my wardrobe. It must be psychological, as every time I see sunshine, I want to wear colour! Speaking of colour, this electric blue dress caught my eye on the SheInside website last month, and I knew I had to have it for spring – I’m a sucker for lace and anything girly, if you hadn't already noticed! The ladies from SheInside were kind enough to send this blue beauty over and it arrived very quickly. For those of you who are interested in purchasing from SheInside, I would definitely recommend that you measure yourself before you buy. This will help to make sure your item fits correctly. I have found the clothing to be very true to size and I’ve been delighted to receive another item which feels like it’s been personally tailored. Although I knew the measurements, this dress is quite short and I would have liked to have been brave enough to forgo the black tights. However, with the extreme winds we’ve had lately (remind me to stop taking blog pictures outside; 1. I almost always freeze to death and 2. My hair goes mental and decides it has a life of its own), I’ve been grateful for an extra layer of clothing to save my modesty. I also think the mixture of black and blue (not white and gold...) works well together and the striking colour still stands out beautifully. What do you guys think of my dress? Have you ever purchasing from SheInside before? Let me know in the comments below! This dress is just my sort of thing! 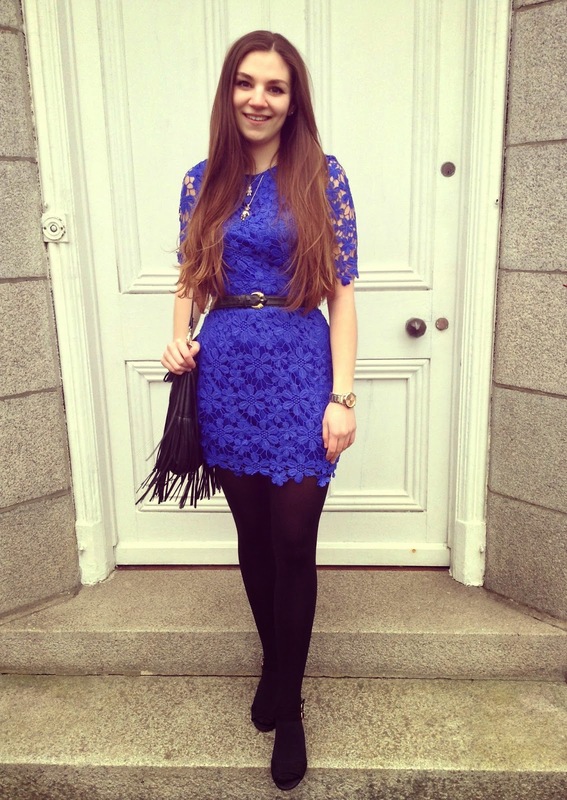 Cobalt blue like this is my all time favourite shade and I love the texture of lace too :) You look stunning! Beautiful in that stunning color lace is so chic. Wow this dress looks amazing on you! I adore cobalt blue and it really suits you! beautiful dress!! I love it with the tights! im sure you'll be able to get away with it sans tights once the weather warms up! lovely blog looks amazing, loving your outfit too the blue dress really brings out your lovely complexion and looks really great on you. you have a stunning figure too. keep up the great blogging look forward to reading more soon. That dress with the leather jacket is the best combination ever!! This dress is so pretty! I adore the colour and the lace detailing is gorgeous. It's my birthday next month and I'd like to buy a new dress to wear during the day (any excuse) and this really is right up my street! Oh my gosh, CUTE! You look so pretty! Love the whole outfit. Beautiful dress and stunning colour! Such a pretty lace dress, that color is seriously gorgeous and I love the texture on it! 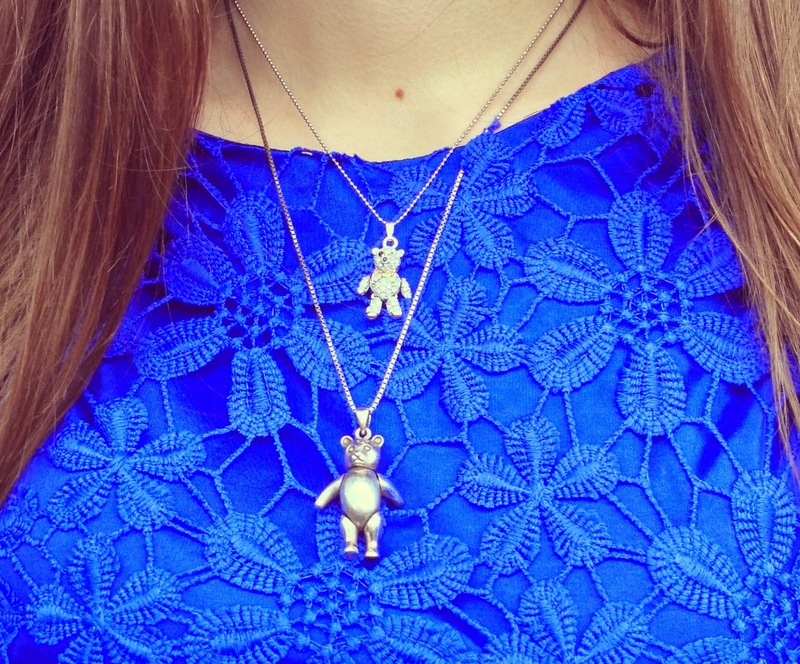 I love the whole outfit and your necklace is adorable! That dress is so cute! I love how textured it is! I absolutely need to get one! That dress suits you perfectly and goes so well with your hair! I love this dress...the bright blue color is so pretty! That dress is stunning! Looks like a good site for clothes, will check them out. This dress is really cute and it does fit you like a glove! LOVE it! I love electric blue. This color pops! I am a sucker for lace too. And I am a huge fan of a feminine lace dress paired with a biker jacket. You look amazing. I love the pretty blue color of your dress. Hi gorgeous! Thank you so much for stopping by my blog! All your outfits are amazing and this one is not the exception. That electric blue looks so great on your skin! Let's keep in touch, dear! So chic looking plus that fringe bag gives so lot of meaning. Wow..pretty dress and it's my fave color! The dress suits you so well! Love that! That dress is insanely gorgeous. I love the colour. Beautiful dress! You look perfect in this color! Such gorgeous dress, love the color ! Such a lovely outfit and dress! I have indeed purchased there and definitively you need to know your measures otherwise things won't fit, but they indeed have amazing clothing pieces. So pretty, I loved your dress. That blue shade is gorgeous! That dress is just so amazing. Loved it. And yes i've already bought at sheinside and really liked it. your dress is so gorgeous, dear! That dress looks fab on you -- love the colour! I LOVE sheinside.com why have i not seen this dress!! it's such a nice dress, great for summer parties! Beautiful dress. The color is wonderful. Kisses! When I see sunshine it makes me want to wear colour too! You look beautiful and your dress is incredible! such a lovely dress! that lace detail is so nice. Gorgeous! Love the color of the dress! such a pretty dress I love it..!! Everything suits you I am so jealous, that looks so lovely on you! Beautiful dress, so pretty !! Hi Helen I like that blue dress a lot, would like to say I would like it if I could follow you via email that way I can always be here when you post something. I love that royal blue dress!! Really lovely dress - the color is just stunning and it really does fit you like it was personally tailored! Oh wow, that blue dress is stunning! The flower pattern on this dress is so beautiful, stunning look! I love it when a great dress and an edgy jacket match so well. That laced dress is so sweet. Love your lace dress, it's so chic and timeless! that is a beautiful dress..and i love the color too. you are radiant in that blue dress!! That colour is perfect on you and perfect for a sunny day too. So gorgeous! That cobalt dress is too perfect for spring! So amazing on you, and I love how you styled it! The black accessories elevate the look so nicely. Adorable! Cute dress, I love the colour palette and the lace detailing. You look beautiful in this blue lace dress! Wonderful choice! Beautiful and bold in blue love! Great move styling with the black, you totally POP! Love the dress, you look amazing! Wow you look adorable in that neon blue dress, love it! In the meanwhile, what do you think of following each other, maybe inspire each other? Please let me know! Have a great weekend, kisses! I BEG YOU TELL ME how you made that photo slide thing in your header PLZ! Loving that dress! So adorable!